Forget farm-to-table. 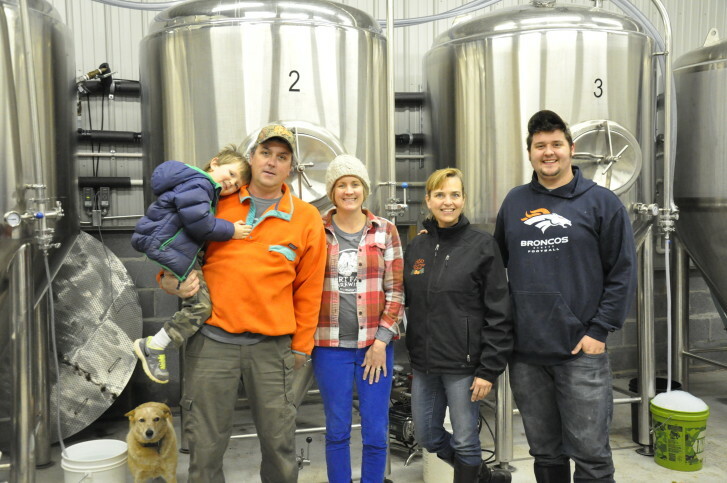 A local family is shifting the focus from the plate to the glass with its farm-to-tap brewery. WASHINGTON — The farm-to-table movement pushed local sourcing and dining to the mainstream. And now, a Virginia family is taking the concept one step further with its farm-to-tap brewery. Bruce Zurschmeide and his family have been farming in Loudon County for more than 20 years. On roughly 400 combined acres, they grow everything from pumpkins to peaches, and even grapes for their winery. But it wasn’t until last year that they discovered a new use for their produce and their land: beer. In May, the Zurschmeides opened Dirt Farm Brewing in Bluemont, Virginia. On 100 acres, they plant and grow everything needed to make beer — from the grain to the hops and even the sweet potatoes and cherries that get added to the mash for flavor. “To be able to grow the ingredients yourself and then dump it into your beer, it really gives a unique taste and a really fresh product,” says Janell Zurschmeide, Bruce’s wife and co-owner of Dirt Farm Brewing. Jumping into the brewing business made sense for Bruce and Janell. They’d tracked the local food movement for years and noticed that consumer interest didn’t end with apples and kale. It extended to beverages as well. “[People] want to know who their brewer is, where the beer is coming from, and it just creates a sense of community,” Janell says. New legislation allowed the Zurschmeides to cater to this demand. In February, Loudoun County passed an ordinance that permits breweries and tasting rooms to operate on farm land where ingredients for the beer are grown. Janell says the law finally gives breweries the same advantage that many of the state’s wineries have. Customers can enjoy a tour and a tasting in the brewery’s main building, and then relax on a large patio overlooking the land, or explore the farm. “For us, already being farmers, already having a winery, we saw the need for the craft beer lovers to have a place to enjoy as well,” she says. It also encourages new business development, while at the same time, preserving the county’s farm land. “To be able to retain a farm like this instead of building it into homes, that’s the cool thing,” Bruce says. Seven months after opening Dirt Farm Brewing, the Zurschmeides aren’t 100 percent reliable on their land for the brewery’s operations, but Bruce says that’s the goal. They also hope to supply other brewers in the area with their homegrown harvest, and have already received planting requests from some. Currently Dirt Farm Brewing, which can brew up to 500 barrels a year on its 10-barrel system, only sells its 10 beers on-tap in the tasting room. Bruce has plans to bottle eventually, but says production will remain small — at least for the next year. Since Loudon County implemented its farm-brewery ordinance, a few businesses similar to Dirt Farm Brewing have opened, and others have plans to do so. Loudoun County currently has 14 breweries, three of which are farm breweries. Janell says she is looking forward to the collaboration the beer boom will inevitably bring. “Farmers have always supported each other in barn raising and coming together as a community to support the new business or the new family getting started in farming, and I think that carries over really well into both farm wineries and farm brewing,” she says. And while the Zurschmeides are enthusiastic about the growth of the industry in the area, they’re just as excited about what it means for their family for generations to come. “I’m excited by the fact that our next generation is coming into the business and embracing it. They want to see this grow,” says Kate Zurschmeide, Bruce and Janell’s sister-in-law and partner in the family business. She says four members of the next generation are already working on the farm and in the brewery, and that’s unique. According to the USDA, the average age of a farmer today in America is 57 years of age. “I think when people can relate to the end product and it’s a little more exciting than broccoli … everyone can identify with a glass of beer, and so I’m just so excited to be sitting at a table planning with my nieces and nephews who are coming into this business and they all see a lot of opportunity,” Kate adds.